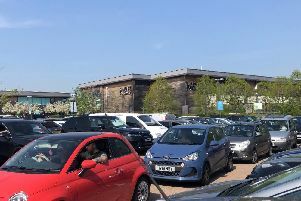 SHOPPERS have expressed their disappointment after a bus service from their village to a shopping centre was axed. The W2 service by First Bus ran from Whiteley Shopping Centre to Warsash but the last day of service was Saturday, July 7, as a result of a lack of use by residents. The centre also runs a W1 service to Fareham town centre. Operations manager at Whiteley Shopping Centre, Darren Gooding, said: ‘The W2 service is something we trialled for 12 months after we started the W1 service, but there was barely 10 people using it per day so it is just not cost effective. In a statement on their website, First Bus said: ‘Unfortunately, due to the conclusion of the contract with Whiteley Shopping to provide this service, the last day of operation of Route W2 was Saturday, July 7. Fellow resident Dave Harbour said: ‘It is just a shame that all concerned parties didn’t think this through properly. I did air my concerns not long after the route had started, but was told that it was successful and full all of the time. It comes as Hampshire County Council looks to review bus services across the county, including the 28/28A which runs from Fareham to Whiteley. Mr Gooding added: ‘The county council is looking at those services because they make a loss, and it would be a shame if they were cut.